How does Coffee Blue work? Your pathway to a successful business is simple and straightforward. You’ll offer all places of work in your exclusive area a high quality coffee served directly from your Coffee Blue vehicle. Your own brand coffee blend is unique to Coffee Blue. It is roasted in the UK by one of the most respected coffee roasters in the industry. As part of your training you’ll learn how to find profitable daily locations and the first ones are included as part of your launch. Locations include business parks, office blocks, factories and even building sites. In fact anywhere where people are found every day will be the foundations of your coffee round. You don’t need many customers to fill your ideal day. Starting and ending when you want will form the backbone of the best mobile coffee franchise just for you and your work life balance. No matter what business you are it’s always best to be in a high growth market place! Over the past 5 years the UK coffee market has experienced exceptional growth. The market is expanding by 37% and is now worth over £3.4Billion per year. Coffee Blue’s management team has extensive experience in van conversions within 5 star rated hygiene environments. The chariot of choice is the bullet proof Ford Transit. It is skilfully converted to provide a beautifully engineered vehicle that has greater reliability. 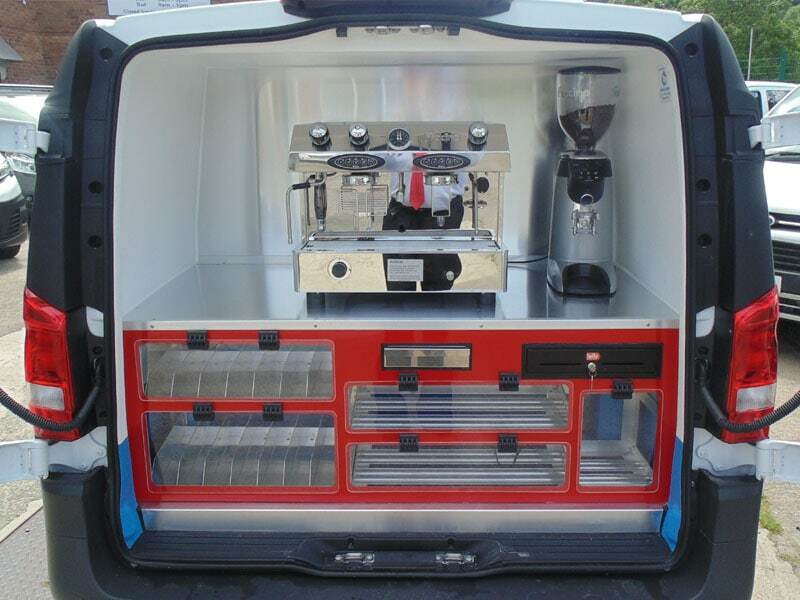 The engineering also means lower initial and ongoing costs than any other coffee van. Vantastec’s quality engineering pays handsomely because unlike diesel generators which are noisy, expensive and sometime give off an odour every Coffee Blue vehicle runs off either LPG (liquid petroleum gas) which is widely available, silent and safe or mains electric via a hook up. So irrespective of the location you can run off grid or plug in! Other vans that rely on batteries experience horrendous future costs. The constant cycle of charge and discharge renders them useless within a couple of years. All of this means that with Coffee Blue you have lower costs and therefore higher profits. Your Coffee Blue Van is a money making machine! Working 48 weeks of the year, Monday to Friday we would expect a new franchise to yield a profit of around £30,000 per van. This is possible with daily sales of £350 per day. If you also add events and weekends to that the rewards can be significantly greater. The franchise is discounted in price. There is also a pre authorised funding deal allowing you to get the van operational regardless of your credit score! If you love coffee and are attracted to an “out and about” business then this may well be the franchise you have been waiting for. Please contact to discuss business.